This couple, complete with a kid at the front of the chap's bike, were ready for green. It's been a while since we've had a little "It's Not Just Us" post - wherein we show that The Cycling Girl - Cykelpigen - is still an integral and iconic part of Danish culture after over a century. 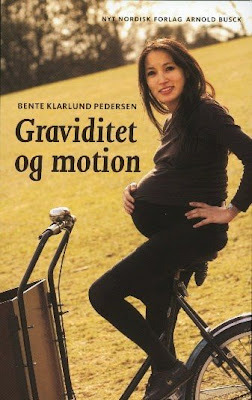 Here's a cover of a book called Pregnancy and Exercise and what better photo on the cover than a pregant woman on a bicycle. It is so interesting to see this as a book cover. Here in the US, the first thing my doctor told me not to do when I was pregnant was ride my bike. No booze, no bikes, no sushi. He was quite adamant about it and was more willing to bend on the wine issue than the bike one. Thought that was odd. Mhmm. My midwives told me the same thing... stay active- but NO BIKE RIDING! What do European women do differently that riding is not a contrandication? Through the blog of Ilaine I came to this very interesting one, and loved the photos and texts about bike. In my town the bicycles are used, in most of the time, to shift to the workplace. We live across from a midwives office and each and every day you'll see pregnant Copenhagners come and on their bikes. I think it is just doctors, in other countries, who cling fast to old studies simply because they haven't heard of any new ones. There have been studies in the past... we're talking decades... about bike riding and pregnancy and 'don't do it' but they have since been disproved. European women don't do anything different, it's just we have done studies in Europe that have shown different results and many times studies don't travel. A lot of it relates to this misconception that cycling is 'a strenuous sport', which it is isn't. The whole 'no fish/sushi' thing dates from a study in the early 90's, if memory serves. Since then, here in Denmark, there have been more recent studies which contradict the older ones. When Wifealicious was pregnant with #1 over six years ago, the advice was the same as with #2 two years ago... raw fish is fine, just avoid, if possible, tuna. A glass of red wine a couple times of week is also often recommended. I concur with Mikael. Same advice here in NL, 'keep moving as long as possible, aka cycle' and 'drink with moderation'. No fuss. hehe, I used to train & ride around my local park and had the occasion to ride several times with one of our riders that was 'preggars' and almost as large as that photo (!). Her husband used to ride along as well (nervously quiet, we chided) while we continued at a slightly slower pace not changing much of our usual banter. Had a healthy Baby, no complications.